Home / Portfolio / Project Done! 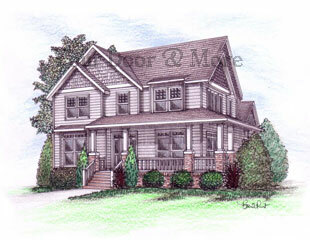 The 14 illustrations that I was working on for a builder in upstate New York is done! It was a challenging project but I finished. I developed an injury in my thumb, most likely a stress fracture seems to be healing fine. The client needed them to be in color, and I am strictly black and white. I worked with another local artist and she did color on top. There was an initial learning curve, but all and all, it was great! Glad to be onto the next job! p.s. Got the balance check in the mail today, that is always a good thing!